can quickly arrange and organize your blocks by dragging and dropping while you come up with the clearest way to present what you have written. Let’s face it, not everyone writes in a perfectly linear manner. Writer’s Blocks frees you from working in this constricted way. When you write in a word processor, you end up constantly scrolling through page after page to see if what you have written is coherent. Writer’s Blocks is a truly visual way to view your written material. Writer's Blocks gives you the big picture. The bird's eye view of what you have written will give you a completely new perspective on your work. If you are familiar with any popular word processing program, you'll be an expert Writer's Blocks user in no time. Most users spend less than 15 minutes learning the major differences between Writer's Blocks and standard word processing programs. While Writer’s Blocks is full of features, the heart of the program is the visual outlining benefits of the movable, sizeable blocks. If you’ve ever had to take notes on index cards and spread them on a table to organize them, then you understand Writer’s Blocks. What Kind of Writing is Writer’s Blocks Designed For? You can use Writer’s Blocks for anything that’s a little complicated. Our customers have really surprised us over the years with the variety of writing projects they have used Writer’s Blocks for: novels, non-fiction books, autobiographies, screenplays, dissertations, legal briefs, speeches, and various business materials among other things. Our goal is not to change the way you write. Instead, Writer's Blocks is designed with flexibility so that it enhances your writing style. 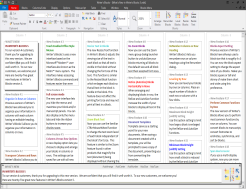 Writer's Blocks has hundreds of optional features that allow you to customize the software to work and write your way. There is a built-in User’s Guide accessed from the Help Menu that fully explains how to use all of the Writer’s Blocks features. We’ve also included sample files to get an idea of how you can use the program. Copyright © 2017 Ashley Software. All rights reserved.